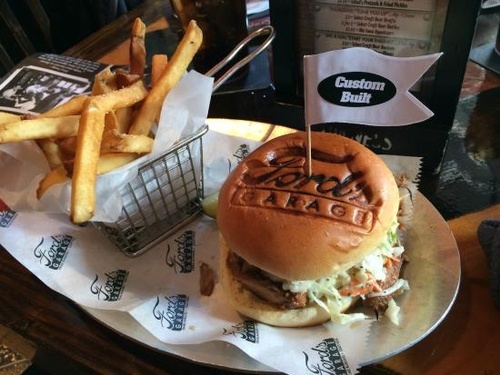 Ford’s Garage is your neighborhood burger and beer joint, where everyone is welcome. 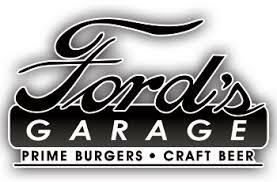 Ford’s Garage will give you the vibe of being in a 1920’s service station to include vintage Fords, gas pumps, and fixtures. Our bars feature prohibition-style elements of old brick, rich wood, and a hand-hammered copper bar top. Many more unique features, too numerous to list, really make The Garage a fun place to visit and take pictures! 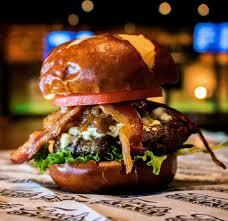 We are a gourmet burger bar serving up the finest varieties of Black Angus Beef, American Kobe, Open Range Bison, Turkey, Chicken, Tuna, and Vegetarian products coupled with all-natural aged cheeses and gourmet toppings. We also specialize in popular American comfort food entrees such as homemade meatloaf, chili, and famous macaroni and cheese. Lighter fare is also available as we also serve fresh salads, grilled chicken, and fresh fish. Our Burgers of Fame give honor and recognition to many of our local celebrities, keeping our connection to the communities we so much appreciate. With a focus on American Craft Beer, our beverage options range from a number of non-alcoholic options, multiple tap and bottle beers, to wine and cocktails. Wesley Chapel Menu? Right here! Let's go shopping at Ford's Garage. Click here. We are open and waiting to serve you!